On March 5th, Rev. 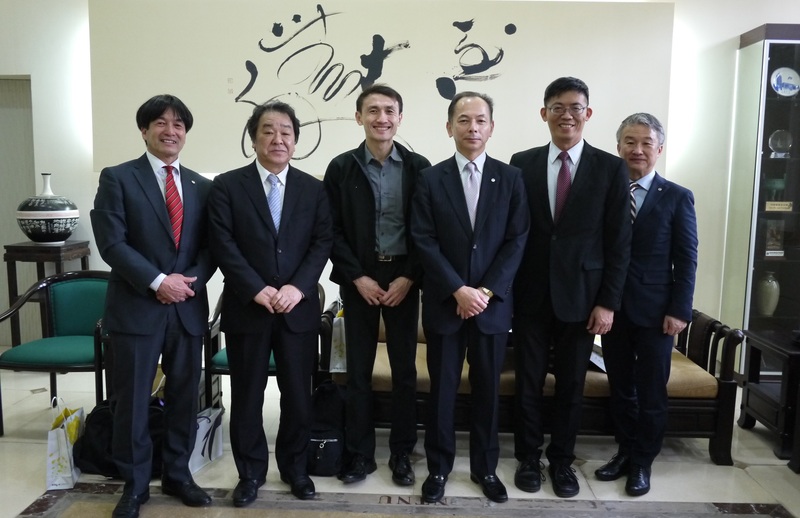 Noriaki NAGAO, President; Prof. Yuzo NAKAGAWA, Head of the Department of the Foreign Languages; Prof. Sakujiro SHIMOMURA, Emeritus professor; Mr. Masafumi ADACHI, Coordinator of International Exchange Center from Tenri University visits NTNU. Prof. Yung-Hsiang YING, Executive Vice President and Prof. Yi-De Liu, Associate Vice President of Office of International Affairs welcomed the guests in person. Tenri University has become partner school with NTNU since 2009, and both sides have had numerous academic cooperation since then. The rate of student exchange is rather high between both universities, laying a solid foundation for the friendship and partnership between Tenri and NTNU. During the courtesy call, the two sides discussed about further possibilities of cooperation in the future. By sharing Japanese students’ and Taiwanese students’ experiences after their exchange programs, they both hoped to develop diverse opportunities for students, especially in the professional fields. Everyone engaged in profound discussion, the guests had a great time in NTNU. Copyright © 2014 Office of International Affairs, National Taiwan Normal University. All rights reserved.